For my bulletin board, I used a technique I’ve used before: copying pictures from an old yearbook. In this case, its a yearbook from 2006/2007 – ten years ago. 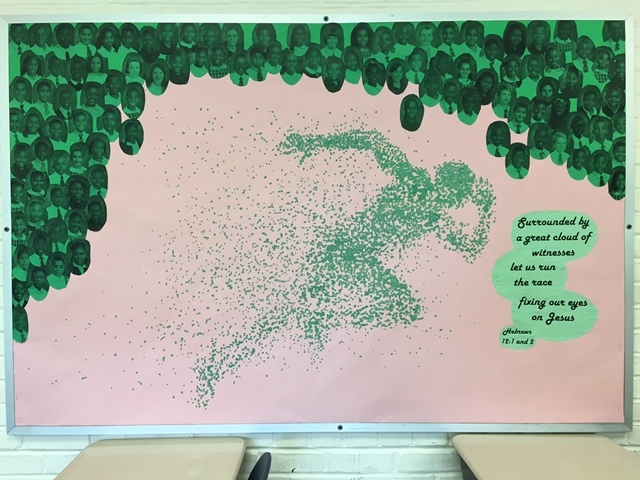 It’s my “cloud of witnesses” – students who have attended the school in the past. I’ll of course talk about the current student body being a cloud of witnesses too. I traced the running man from a projection. It’s magic marker dots. The other boards I worked with yesterday were the white boards I got off of Craigslist. I pulled off my co-worker Kayla’s old chalk boards (which were painted sheets of metal), drilled new holes, and screwed in the white boards. 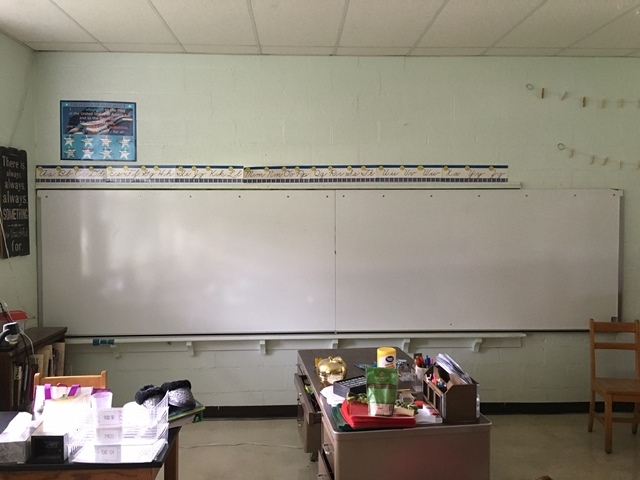 It was made much easier by the fact that there was a ledge under the old black boards that held the white boards while I drilled and screwed. So beautiful and so much brighter. I forgot to take a ‘before’ picture. That running man!! That is … breathtaking!! Oh, my goodness, Brad, that is just inspired. Super, super cool. The bulletin board is “spot on”! Love it! Nice job on the whiteboards. Your BB skills are unsurpassed – miss those. Good job, sir! You had to put up your own white boards?! I shall never complain about needing to screw on loosened chair backs of student desks again then. Great look – awesome classroom – go get ’em! Bulletin Board — AWESOME!!! The runner is COOL. Did you also cut around each face for that? I did. It was a little time intensive to do this board, but it will stay up all year. I won’t be changing it each quarter or each season of the year.